1. Reaching Out to Non-Metro/ Non-Urban Markets: AS metro and urban markets get saturated by products and services promoted in both general and direct marketing models, the key to any direct marketing campaign lies in expanding its reach to rural and semi rural markets. Infrastructure constraints have so far come in the way of the direct marketer. But with rural cyber cafes, satellite television reaching rural areas, telecom booths and mobile telephony now gaining popularity, it should be possible for the marketers to reach out to their target market in these areas. Indian post offices are located in the farthest corner of India and services villages with a population as low as 20 households. These offices can be used as an effective medium to communicate, deliver and even service the rural customer. IDBI, ICICI, SBI and other financial institutions are today directly marketing their mutual funds and other financial products through the Indian post offices. Thus, the key to success in the Indian market lies in the firm’s ability to access rural markets. 2. Enhancing Credibility of the Offer: The Indian customer generally does not buy the product or service until he/ she has seen it, touched it and experienced it. Therefore these are key ingredients in the customer’s selection process and the direct marketer has to enhance his credibility as he cannot offer these benefits. Therefore, he needs to pay special attention to ensuring that the customers’ experience with the product exceeds his/ her expectations. Also he needs to focus on service to ensure speedy settlement of any claims. Credibility is the key to success in direct marketing. 3. Wider use of Debit and Credit Card: Direct marketing’s success in India will be dependent on the wider use of debit and credit card as mode of payment by both the customer and the marketer. This involves a shift of transactions from cash to non cash modes and hence a change in the customers and sellers’ mindset a shift of transactions from cash to non-cash modes and hence a change in the customers and sellers’ mindset. 4. Emergence of Specialized Database Firms: Another key factor in the success of direct marketing is the evolution of specialized database firms. It is an expensive proposition both in terms of money and time to create a customer database. This makes direct marketing feasible only for large firms. A very large component of the Indian economy consists of the small and medium sized firms who cannot afford to create this database. Hence emergence and evolution of firms specialized in database management will contribute to the success of direct marketing in India. To conclude, direct marketing has arrived in India, but, is still an urban and metro phenomenon. It is gradually widening out to non-urban areas too. It is important to remember that competitive marketing strategies involve using a combination of general and direct marketing approaches. 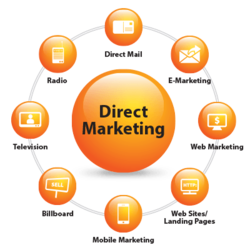 Know more about direct marketing in India only at the University Canada West.